Yesterday, I had dh’s lunch ready and waiting on the kitchen table. I told him where it was before I left the house to run the boys to school. When I arrived back home, can you guess what I found waiting for me on the kitchen table?! Called him up while he was driving in to work and told him what he forgot at home. He invited me out to lunch (a date!) at our favorite Thai restaurant. Now how could I pass that up? Plus, he had been away in Atlanta for the past three days. I snatched our little camera and placed it by my purse so I would not forget it. Two hours later, I popped into the car and was off. I thought while I was driving that I would snap pictures of some of the major sites of the area. Forty five minutes later, I was picking up dh and sitting down to some wonderful food. Then it was time to zip back home to be on time for picking up the boys. <---- My Ipod ready to roll! BMW - the only Factory in the US. The only BMW museum in North America. The Z's and X cars are produced here. They are adding on and getting ready for the new line of cars. <--- Whoa! The gas was much cheaper up by dh's work than where we live. 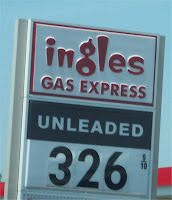 We are paying about $3.35 for a gallon. Dislcaimer: I do not encourage or promote the act of taking pictures while driving.